Led by Russell Simmons, an Imam and a Rabbi, the rally is in protest of the Trump Administrations ban on Muslims. Today the #IamMuslimToo rally is taking place in Time Square, New York City to protest the Trump Administrations controversial travel ban on Muslims. Organized in only ten days by Def Jam Co-founder Russell Simmons, Imam Shamsi Ali, Rabbi Marc Schneier, Daisy Khan, and Linda Sarsour, the rally is in solidarity and support of all Muslims being effected by the ban. "Our Muslim brothers and sisters have not only been demonized but they've been the victims," said Simmons. "So we are hear today to show middle America our beautiful signs and through our actions and intentions that they have been mislead. That the seeds of hate that were small, and maybe just ignorance, cannot be watered and that hate cannot grow because we are a system promoting love." Susan Sarandon made a guest appearance and urged protesters to "fight hatred with love." Q-Tip is also scheduled to make a special appearance. 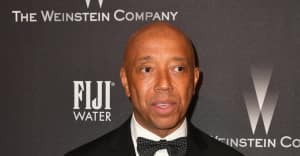 The protest is from 12 p.m. to 4 p.m. and is being live streamed on Russell Simmons Facebook page. Check out the some of the many supporters posting on social media under #IamMuslimtoo below.